Successfully Added CHUWI Hi8 Pro Windows 10 + Android Tablet PC - 8 Inch 1920x1200 Display, USB Type-C, Mini HDMI, OTG, Bluetooth to your Shopping Cart. Adopting new USB Type-C technology mens your set for the latest revolution in computing with super fast connectivity for the latest generation of deices. There is also a micro SD card slot so adding extra storage as and when you need couldn't be easier. Under this 8 inch tbalets quality outer beats a quad core CPU from Intel that utilizes 64 Bit technology as well as Intel 8Gen graphics and 2GB of RAM, so you're guaranteed an exceptional performance and the 3D gaming support really puts uyou in the heart of the action. With a 4000mAh battery brining up to 3 hours of continuous video viewing or around 48 hours on standby this 8 inch tablet is more than suitable for a day's worth of light usage. 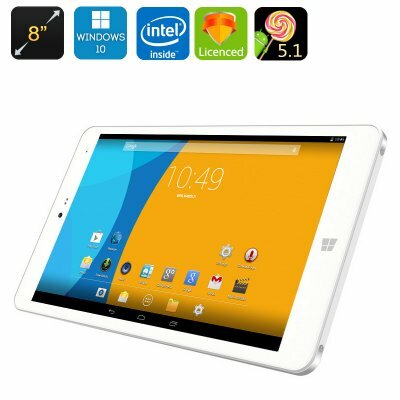 The CHUWI Hi8 Pro Tablet PC comes with a 12 months warranty, brought to you by the leader in electronic devices as well as wholesale Windows and Android tablet PCs..
Sending packed very good , delivery fast . The tablet works well , just like in the description. Seller thank you.